﻿Seventeen-year-old Lila Beckwith's parents just left for vacation, and Lila's all set to throw the holiday party of the season. 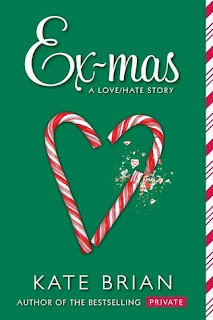 But when her Christmas-obsessed little brother, Cooper, discovers that global warming is melting the North Pole, he and his best friend, Tyler, take off on a runaway mission to save Santa. Lila has to get Cooper safely home before her parents get back on Christmas Eve. But the only person who can help her is Tyler's older brother, Beau — a.k.a. Lila's musician, anti-everything ex-boyfriend. I love reading Christmas books during this time of year. Since I don't live in a place that really feels like Christmas, I like to read about other people's stories! I read this one a couple of years ago, but I thought it was time to read it again and review for the holidays. This is pretty typical young adult romance stuff. Girl has most coveted boyfriend, boyfriend is away at college, girl ends up having to spending time with unpopular ex-boyfriend. It doesn't matter, though, because this book was absolutely the most adorable, grin inducing Christmas romance! First off, I was absolutely charmed by Lila's little brother Cooper and his urgent need to save Santa from global warming. Modern day Santa troubles we've got going on there. I can't imagine having your little brother run away, it would be terrible, but it would be terrible and awkward having to find him with your ex. One you don't think to highly of these days. I liked that this had a bit of road trip incorporated, because I am a huge fan of road trip books! Lila and Beau were so fun together, whether they were bickering or actually getting along. It was pretty obvious that Beau was an all around decent guy and Lila's opinions of him weren't exactly fair or deserved. Popularity warps people sometimes. Lila turned out to be a pretty great character. I wasn't completely sold on her at first, but she definitely grew on me in a big way and I was a fan by the end. Lila's friends didn't really do much for me in the story. They gave some insight into the way Lila behaved, but I really would have been okay with cutting them out in favor of more time with Beau! I loved this book too! It's so cute, fun and easy read for this season. Great review!